Sidney Blumenthal has an item on Condoleezza Rice in the Guardian this week that gives the sorry history of how, put in charge brokering the “Roadmap to Peace” with Israel and the Palestinians, she kind of made a hash of things. If that topic still interests you, you might give it a read. But the last paragraph is a killer. Cheney as Richelieu? An amusing notion. Let’s see. Richelieu ordering the siege and finally the occupation Les Baux en Provence, finally getting rid of the protestant rebels holed up there, way back when. Can’t have religious fanatics holding a fortress and being a potential threat. Richelieu - the power behind the throne making such decisions. The king was useless. Cheney ordering the siege and finally the occupation of Iraq, getting rid of the troublesome terror-master holed up there – can’t have religious fanatics holding a fortress and being a potential threat. Cheney - the power behind the throne making such decisions. The king was useless. Works for me. Except the Hussein Baathist folks were a secular crowd. But whatever…. Kevin Drum, over at The Washington Monthly discusses Condoleezza Rice's first book, written in 1984 - The Soviet Union and the Czechoslovak Army, 1948-1983: Uncertain Allegiance. He points out that this tome was met with immediate skepticism from at least one scholar of Czechoslovakian history who seemed to think that she had an unfortunate tendency to formulate opinions without regard for the actual facts on the ground. He covers what Joseph Kalvoda, a history professor at Saint Joseph College, had to say about it in American Historical Review. Joe thought she was full of crap. You can investigate this through the link here, and Drum’s links. Let's review: Problems distinguishing facts from propaganda. Too quick to pass judgment without adequate knowledge. Failure to properly assess sources who have an obvious axe to grind. Ignorance of regional history. 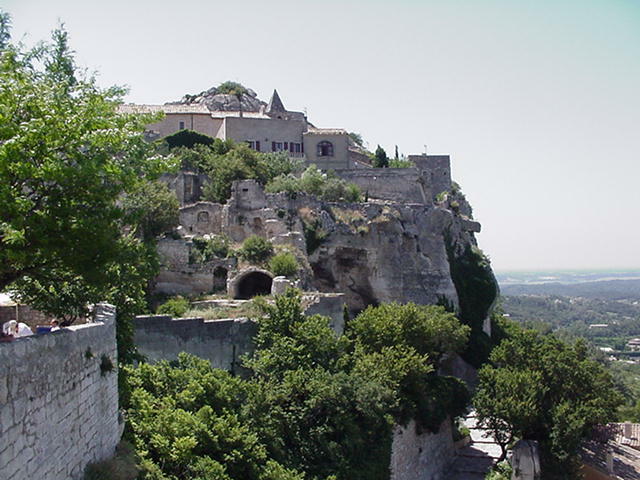 From my trove of odd pictures of places I have visited, the old mountaintop fortress at Les Baux en Provence, some miles south of St-Rémy and an hour’s drive north of Arles. Cocteau filmed Orphée here – well, in the rocky valley below, actually. That would be the Val d'Enfer (The Valley of Hell?) of course. In 1632, Richelieu razed the feudal citadel to the ground and fined the population into penury for their disobedience. From that date until the nineteenth century, both citadel and village were inhabited almost exclusively by bats and crows. The discovery in the neighboring hills of the mineral bauxite (whose name derives from "Les Baux") brought back some life to the village. It’s quite the tourist attraction now. Today the population stays steady at around four hundred, while the number of visitors exceeds one and a half million each year.